Justin Ladies Gypsy Western boot in Aged Bark Cowhide Foot with Perfed Saddle and 12 Inch Real Tree Buffalo Top with Collar featuring J-Flex Flexible Comfort Insole System for all day comfort. 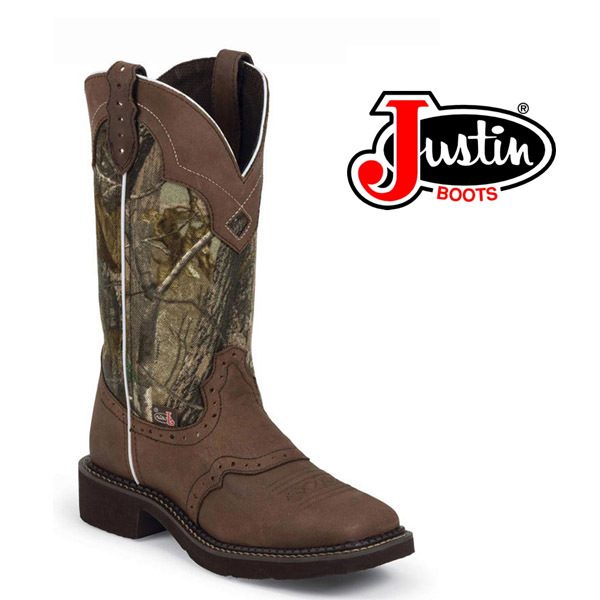 This boot also features a Wide Square Toe with Unit Block Heel and Rubber Outsole for long wear. J-flex flexible comfort system - designed with a triple density insole that combines strength and flexibility. This leather-covered cushioned insole adds ultimate comfort. Best of all its removable.